What is antebellum architecture? It’s a term used to characterize a style of grand residences largely found in the Southern United States, especially the Deep South, built in the 19th century. As grandiose as these intricately designed homes are, their magnificence has deep and controversial roots in slavery. Here’s a look at these extravagant homes, their defining features, and the ongoing debate about preserving antebellum properties. The word “antebellum” simply means “before the war” (from Latin “ante” translates to “before” and “bellum” translates to “war”). In this case, the war being referenced is the Civil War fought between the Northern and the Southern states from 1861 to 1865. 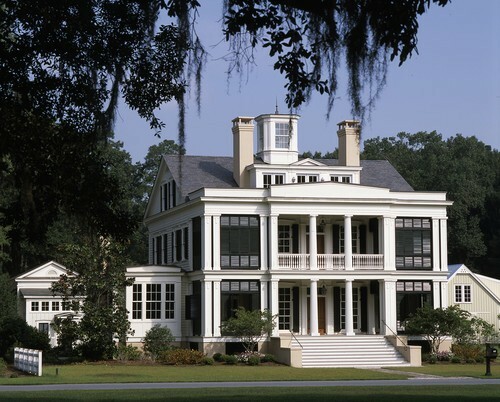 The term “antebellum architecture” is commonly used synonymously with popular neoclassical house styles like Greek Revival, Gothic Revival, and Italianate. “The style’s rise in Europe came after discoveries of ancient Greek buildings in countries along the Mediterranean, revealing the classical forms of architecture employed by the Greeks and Romans,” says Kitchens. “The columned porticos of buildings provided shade to the front of the house, which was important in hot climates found in the Southern states,” says Kitchens. It’s estimated that less than 20% of the structures once dominating the South during the antebellum period remain intact. Many were burned during the war, and others were lost more recently due to natural disasters or neglect. “Outstanding examples of Greek Revival structures from the antebellum period are found in the Old Governor’s Mansion in Milledgeville, GA, and Stanton Hall in Natchez, MS,” says Kitchens. There’s an ongoing debate about preserving antebellum homes and plantations as the mansions were most often built with fortunes made from slavery. Some contend it’s not ethical to preserve houses built and maintained from fortunes created through slavery. But for others, the homes have historical significance and serve as tourist attractions exposing the public to the South’s slave-based economy. The antebellum museum Boone Hall, for example, has the original slave cabins built between 1790 and 1810 included in its “Black History in America” exhibit.